Hi friends! Do I have an amazing summer salad for you? 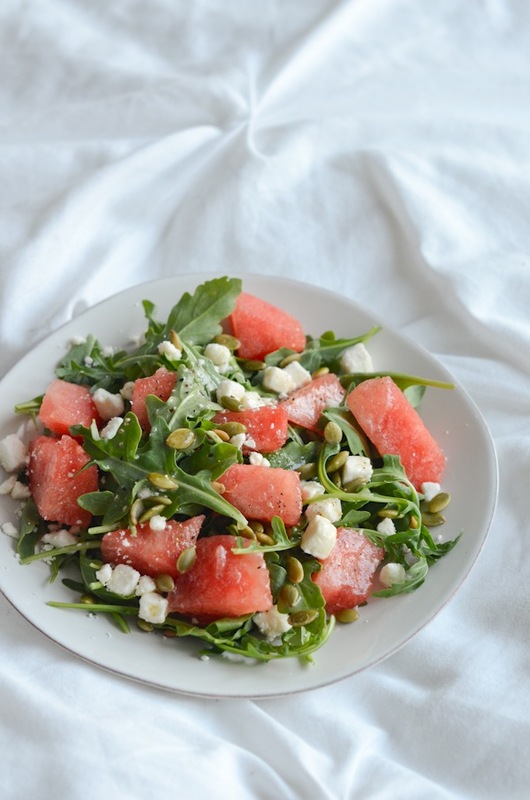 This watermelon arugula salad with lime vinaigrette recipe really hits the spot on a hot day. I love it as a light dinner or side salad to my main dish. If you’re lucky like me, your local grocery store sells pre-cut watermelon meaning this no-cook recipe only takes a couple quick minutes to assemble. Woop! This salad was inspired by the one I had in Pittsburgh about five years ago. The flavors are simple, light, and delicious. You can put this Watermelon Arugula Salad with Lime Vinaigrette Recipe together in five minutes or less. Easily. If you get the watermelon pre-cut, it’s just a matter of layering. And the lime vinaigrette takes about 60 seconds to whip (get it?) up. Speaking of the dressing, I believe a true vinaigrette would include more olive oil. But, I like how this is mostly-lime juice. Feel free to adjust your proportions to your preference. I feel like this Bon Appetit article (which says 3-1 is the classic oil-to-acid ratio for vinaigrette) is giving me permission to bend the rules. Not only is this salad pretty and delicious, it’s good for you too! Two cups of arugula contain a mere 10 calories but will provide over 50% of your daily vitamin K in addition to other health benefits. Watermelon is good for a number of things. The fruit contains choline which can help reduce chronic inflammation. Watermelon can also help you with workouts by helping to reduce muscle soreness and recover more quickly. 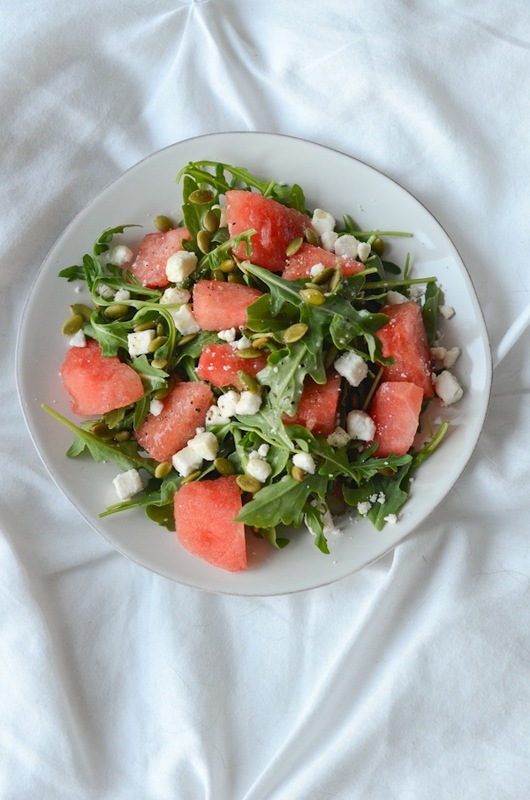 This refreshing Watermelon Arugula Salad with Lime Vinaigrette is perfect for a hot summer day as a light dinner or simple side salad. Customize the proportions as you’d like. Skip the cheese to keep this vegan. 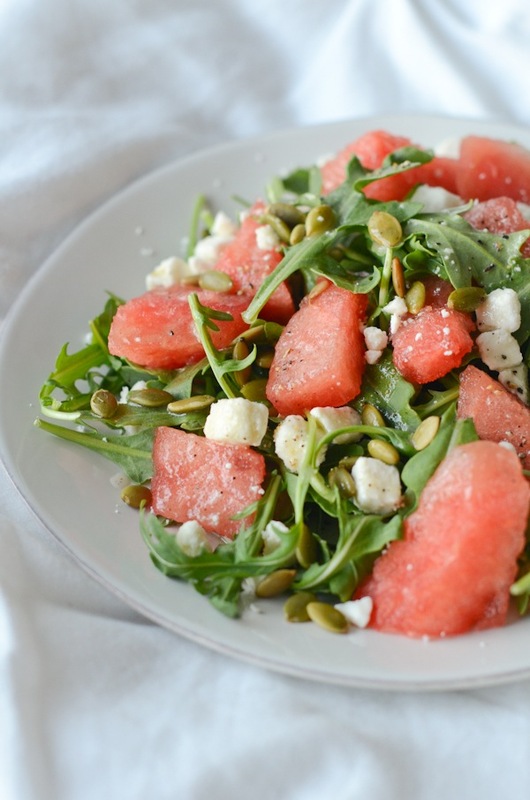 In a large bowl (or on a plate), spread arugula and top with watermelon cubes, feta, and pumpkin seeds. In a small bowl, combine lime juice, extra virgin olive oil, salt, and black pepper. Whisk together (with a whisk or fork) and pour over the salad. Taste test and add more salt and pepper, as desired. Enjoy! Thanks for reading! 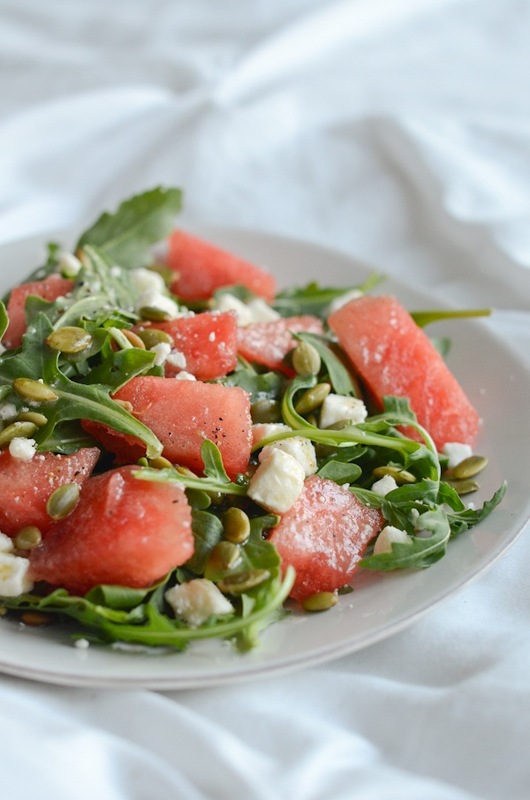 Hope you enjoy this Watermelon Arugula Salad with Lime Vinaigrette Recipe.